Deciduous tree with heavy, craggy branches, up to 25 m tall but often small, shrubby and as short as 1 m in dry, rocky habitats; trunks up to 1 m wide; bark light grey with thick scaly ridges. Alternate, deciduous, blades oblong to egg-shaped in outline with 3-7 lobes per side, the lobes entire or 2-3 toothed, up to 12 cm long with stalks 1-2 cm long, the largest sinuses extending more than halfway to the midrib, bright shiny green and glabrous above, paler below with reddish to yellow hairs, turning yellowish-brown in the fall. Inflorescence of tiny inconspicuous male and female flowers, these separate but on the same tree; female flowers clustered or single surrounded by a scaly cuplike involucre; male flowers numerous in catkins. Acorns, 1-seeded, maturing in one season, unstalked, egg-shaped to nearly round, 2-3 cm long; cups shallow, bumpy, hairy within. Mesic to dry grasslands and rock outcrops in the lowland zone; locally common on SE Vancouver Island and the Gulf Islands, rare in the lower Fraser Valley; S to CA. In British Columbia, Garry oak is most easily confused with the introduced English oak (Quercus rubur). The two species may be separated by characteristics of leaf lobing, leaf stalks, and acorn morphology. 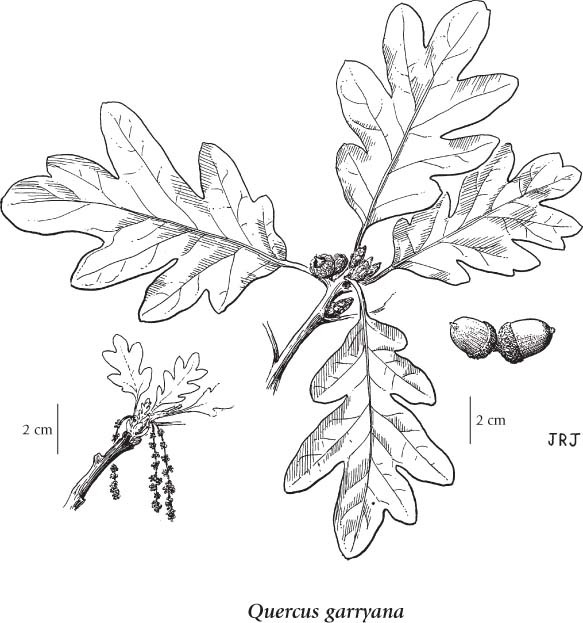 In English oak, leaf lobing is shallow, less than halfway to the midrib, while in Garry oak lobing often extends more than halfway to the midrib. Leaf petioles in English oak are short, 1-3 mm long, while in Garry oak they are 1-2 cm long. English oak acorns have relatively long stalks, while Garry oak acorns are stalkless. Identification in oaks can be challenging because of the frequent occurrence of hybrids. A shade-intolerant, submontane to montane, Western North American deciduous broad­leaved tree distributed more in the Pacific than the Cordilleran region. Occurs in maritime to submaritime summer-dry cool mesothermal climates on very dry to moderately dry soils; its occurrence decreases with increasing latitude, elevation, precipitation, and continentality. Sporadic to scattered on southeastem Vancouver Island and islands of Georgia Strait (less frequent on adjacent mainland). Usually forms open-canopy stands on water-shedding (rock outcrops) sites. Its calcium-rich bark supports corticolous moss communities. Characteristic of dry mesothermal forests.